Billy Blue Eye Pottery is pleased to offer a six piece collection of Roseville Pottery’s 1938 “Teasel” pattern. The set consisting of a low jardiniere, a low vase and four six to nine inch vases are terrific examples of Roseville’s Art Deco inspired pattern. The elegant line of a single stem from the teasel plant artfully placed as if touched by the wind is a reminder of the beauty found in the understated decoration presented in this Roseville offering. 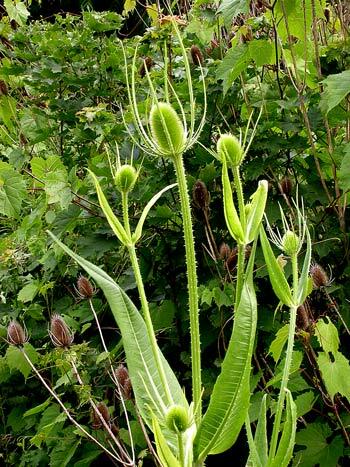 In “Teasel” Roseville shows us its versatility in depiction of flower and nature; a dramatic departure from other 1930’s floral patterns such as “Poppy”, “Sunflower” and “Fuchsia”. This very special offering can be seen and purchased today at the Long Beach Antique & Collectible Market in Long Beach, California. Long Beach Collectible & Antique Market is located in the Veteran’s Stadium Parking Lot from 7:00 AM until 2:00 PM. We are located in space # A 853. Click here for 10% off Admission Discount Coupon. In addition to Roseville, Billy Blue Eye will be featuring today works from Van Briggle, Weller, McCoy, Beswick, Stangl, Blue Mountain, Red Wing, Rookwood, Catalina, Sascha Brastoff and many other fine ceramic companies. Look for our green & white tent, we look forward to seeing you there! I bought a Catalina Pottery Fan Vase with the marking Catalina Pottery Made in USA stamped in ink and C-310 on bottom. It is turquoise on the inside and white on the outside. Could you give me an estimate of what this vase could be worth? It is in excellent shape with no flaws. Thank you for visiting our website BillyBlueEye.com. The vase that you describe is one that I have carried in our inventory on a couple of occasions.. The fan vase was created circa 1937-1943 by the Gladding McBean Company in Los Angeles under the Catalina Pottery name. GMB bought the rights, inventory and molds from Catalina Island Pottery in 1936 as the Island did not have enough clay to meet production demands and it was cheaper to produce the pottery in Southern California as opposed to shipping the clay to Catalina Island. This vase on my estimation carries a book value of $115.00. The last one I had (December, 2010) sold for $95.00. Therefore your example would be valued in that range of $95 to $115. The color combination that you have is preferred by collectors although I believe that the same vase was created in coral/ivory and green/white combinations as well. I try to keep our Catalina Pottery page in the website current, so please let us know if we can help you expand your collection. Thanks again for your inquiry and have a great weekend.